There is perhaps no Commandment more gratuitously broken by the Roman Catholic church than that of the Second Commandment. It is full of idolatries, sacred relics, venerated objects, and superstitious and “sacred” artwork depicting God and angels. 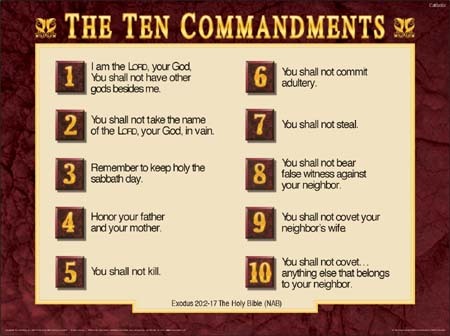 Conveniently, the Second Commandment is not listed in the Decalogue by the Roman Catholic church, and it sweeps it under the First Commandment like dirt under a rug, and tear the Tenth Commandment into two, in order to not focus upon the prohibition of icons and artistic representations of God and still end up with an even ten. You can see a picture of the fractured, broken, Second Commandment-less Decalogue of the Romish church below. The Romish church is known for her gross idolatries and profane images of God. If there is any doubt that they venerate (Latin, for “worship”) art, consider the video below. The audible gasps of panic and woe heard in these videos are startling reminders that Papists see these representations of holy things as spiritually significant. Whether it’s ascribing spiritual power to objects like the rosary beads or clearly counterfeit relics or using statues and artwork to “assist” their worship of Almighty God, the Roman Catholic Church is – with perhaps the exception of Eastern Orthodoxy – the grossest representation of idolatry in professing Christendom. John Calvin wrote,“God is opposed to idols, that all may know He is the only fit witness to Himself. He expressly forbids any attempt to represent Him by a bodily shape . . . We must hold it as a first principle, that as often as any form is assigned to God, his glory is corrupted by an impious lie” (Institutes of the Christian Religion – 1:11). The Lord hath made bare his arm and eased him of his adversaries, for Jehovah, whose name is Jealous, is a jealous God. With what indignation, then, must the Lord look down upon that apostate harlot, called the Romish Church, when, in all her sanctuaries, there are pictures and images, relics and slivines, and poor infatuated beings are even taught to bow before a piece of bread. In this country, Popish idolatry is not so barefaced and naked as it is in other lands; but I have seen it, and my soul has been moved with indignation like that of Paul on Mars’ Hill, when he saw the city wholly to idolatry; I have seen thousands adore the wafer, hundreds bow before the image of the Virgin, scores at prayer before a crucifix, and companies of men and women adoring a rotten bone or a rusty nail, because said to be the relic of a saint. It is vain for the Romanist to assert that he worships not the things themselves, but only the Lord through them, for this the second commandment expressly forbids, and it is upon this point that the Lord calls himself a jealous God. How full is that cup which Babylon must drink; the day is hastening when the Lord shall avenge himself upon her, because her iniquities have reached unto heaven, and she hath blasphemously exalted her Pope into the throne of the Host High, and thrust her priests into the office of the Lamb. Lou Engle is a charismatic leader known for hosting 12-hour prayer rallies as a part of his ministry, “The Call.” He was a senior leader of the International House of Prayer and is widely seen as a “general” in the New Apostolic Reformation. In recent years, Engle has become increasingly tied to Rome. To the left, you’ll see a photograph of Lou Engle kissing the feet of a Vatican representative at Asuza 2016, representing his reuniting with the Roman harlot. One could hardly imagine a more ecumenical experience than that of a supposed Protestant evangelical kissing the feet of a representative of who Protestants have historically identified as the very Antichrist. Engle has continued along that trajectory, and today he tweeted out a statement of affirmation for the Pope of Rome, as seen below. Of course, the Pope’s artists depict God Almighty, the Holy Spirit, and the Lord Jesus Christ in direct defiance to the Second Commandment. They should hardly be encouraged to defy God’s great Commandments. Likewise, the Pope should not be encouraged. He should be brought to penitent and genuine Sola Fide belief in Jesus Christ or he must be destroyed in the brightness of Christ’s coming. Are We Doing in Moderation What Ergun Caner Has Done in Excess? Next story Should a Christian Celebrate Halloween?